To be completely honest, I hadn’t heard about Zermatt until Summer 2017, when I started reading John le Carré’s novel ‘The Night Manager’. Funny enough, but this was the time when I found out about this place. The descriptions of the mountain sceneries were so alive and moving that I added the place to my bucket list. Who knew I would have an opportunity to visit it so soon?! 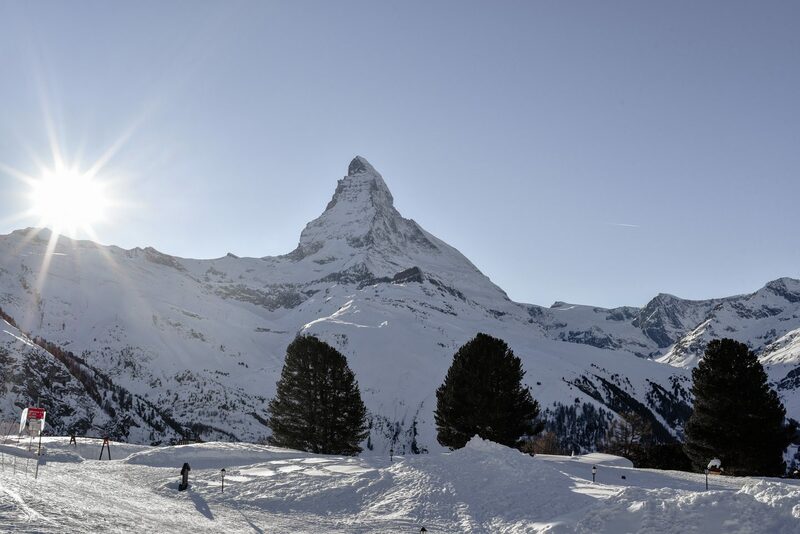 When Ros and I were picking a place to visit after New Year, I really wanted to find myself in a snowy and beautiful Winter Wonderland, and we already knew that it would be Switzerland, so it was easy to recall the place I’ve read about in the novel and afterwards saw in the BBC series. Our choice of the hotel wasn’t spontaneous, too. 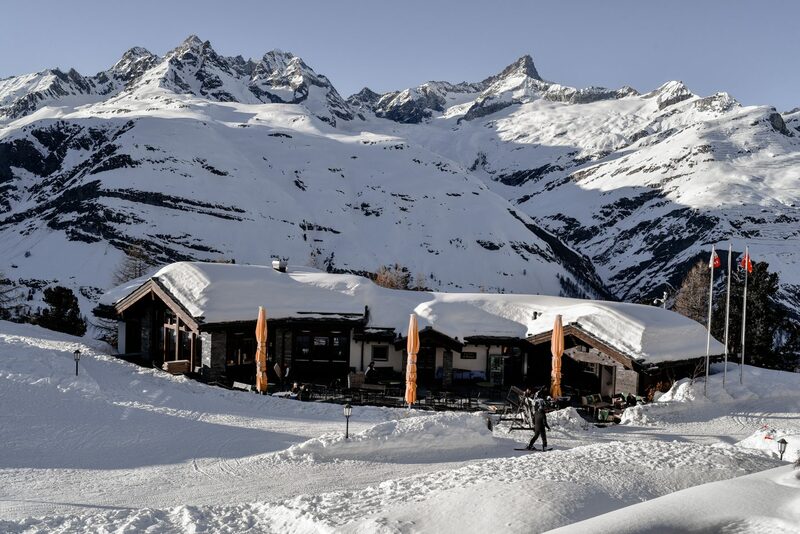 Riffelalp Resort was one of the locations where they shot some of the memorable Zermatt scenes for the infamous series; the view is honestly to die for. The time we spent at the resort was easily one of the best in our lives. It was quite a trip to get there from the Geneva airport (around 4hrs on a train with two changes), but taking trains in Switzerland is actually super enjoyable. Almost all of them have panoramic windows and sceneries you pass by wake an urge to film every single second. At the Zermatt train station, we were greeted by the concierge from the hotel, who carried our luggage to another train that took us to the mountains. 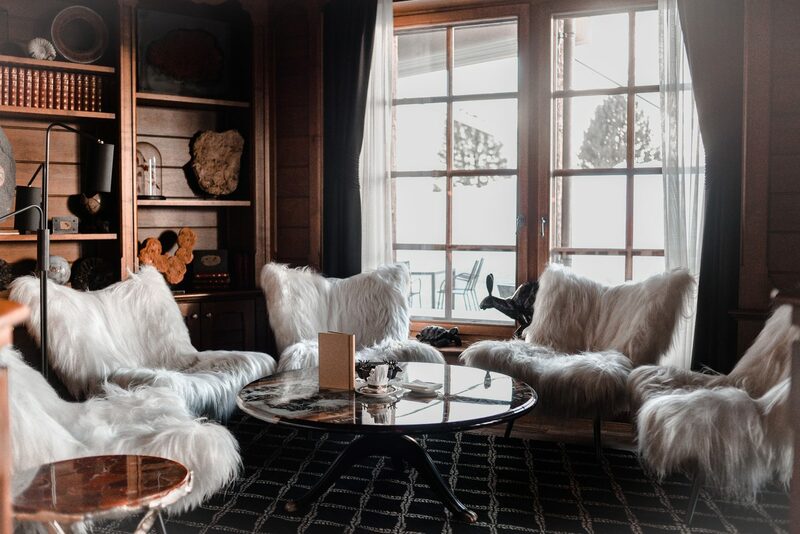 The hotel is located at a 2222m height, in a bit of isolation from not-so-busy Zermatt centre, but that only makes you feel even more like a movie character. 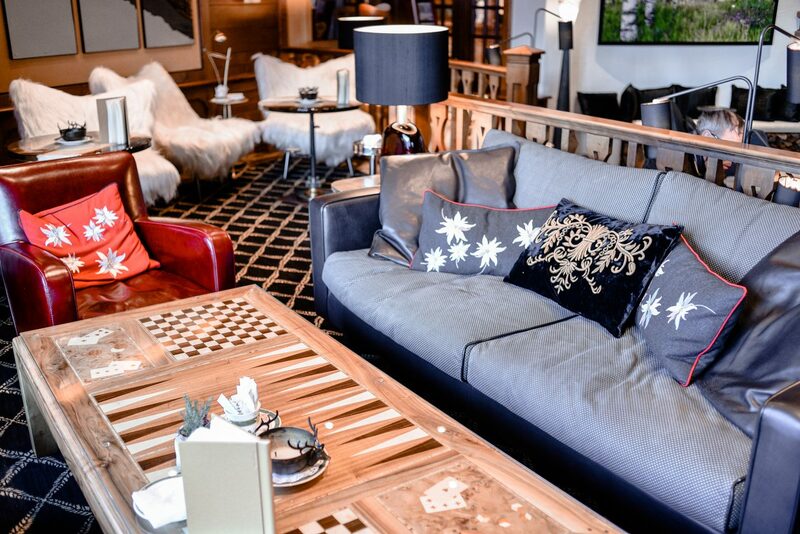 Inside, the hotel looks so stylish, modern, but still super cosy and warm. The decor was renovated a couple of months ago, so everything looks very new, and that definitely exceeded my expectations, because, at the hotel like this, I expected to see a traditional and more conservative interior (read as boring). Lovely woman Petra, who is a PR manager of the place, told me that the main goal for the interior designer was to make guests feel like they are surrounded by nature, even when they are indoors. 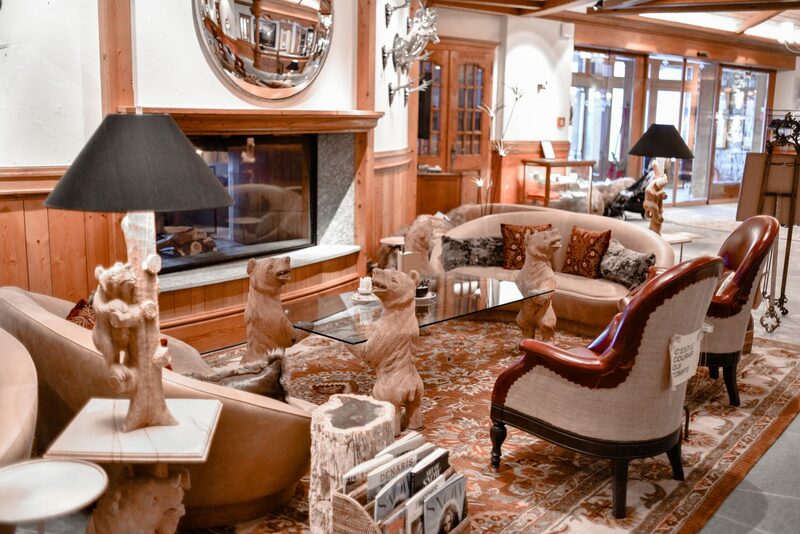 This is why you can find so many references to natural textures and animals in the hotel. 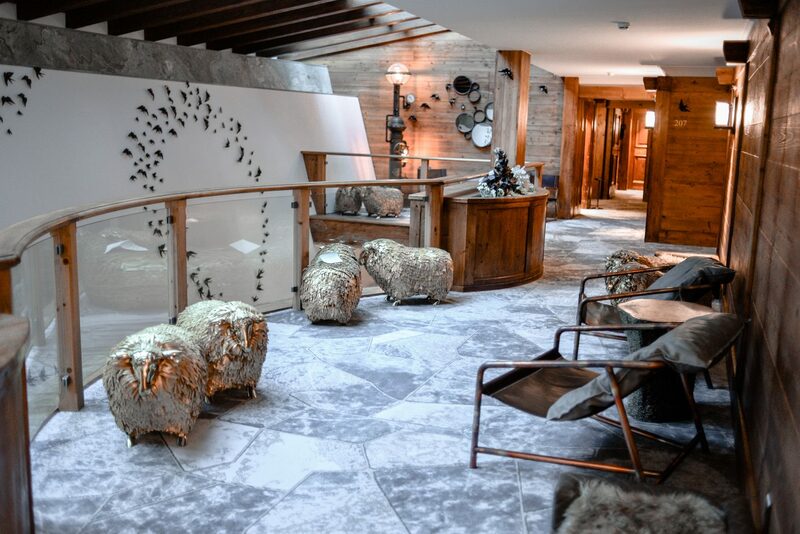 My personal favourite was the metallic sheep, you could find them everywhere – in the hallways between the rooms, at the lobby, by the entrance. 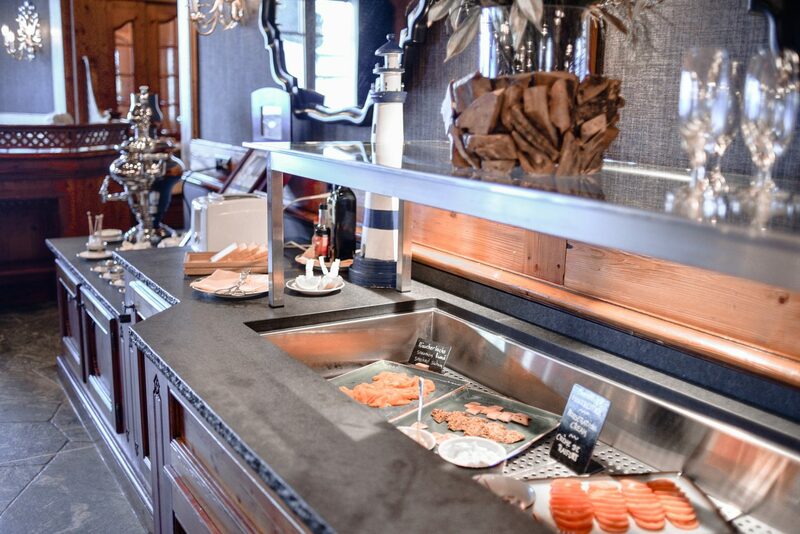 There are so many small details in every single room; you could really spend hours wandering around the hotel. 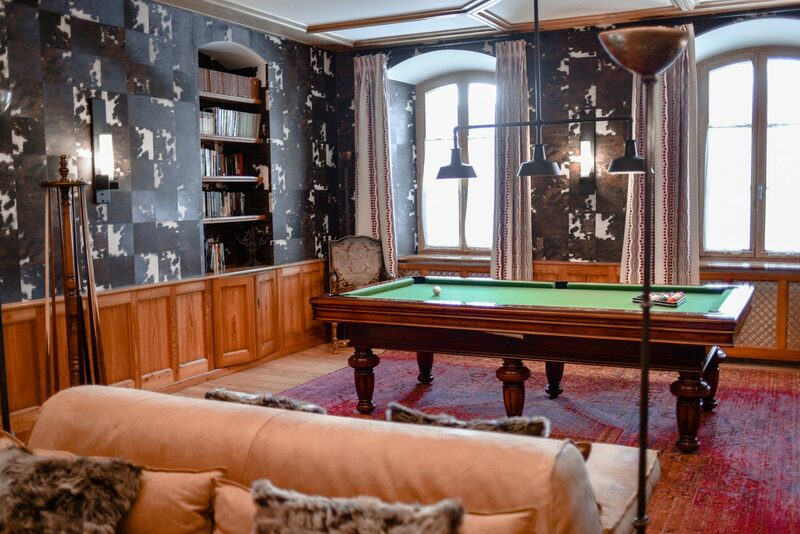 There are two restaurants on-site, one is Italian and is located outside the hotel, and another one is in the basement and specialises in fondue only. 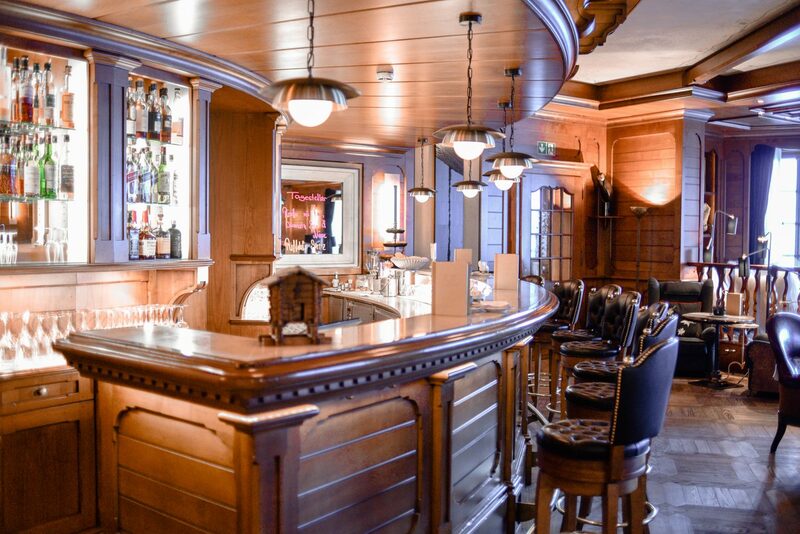 We had a chance to try both, and I can tell that the food was really good and not too pricey, compared to the prices we’ve seen in other restaurants in Zermatt. 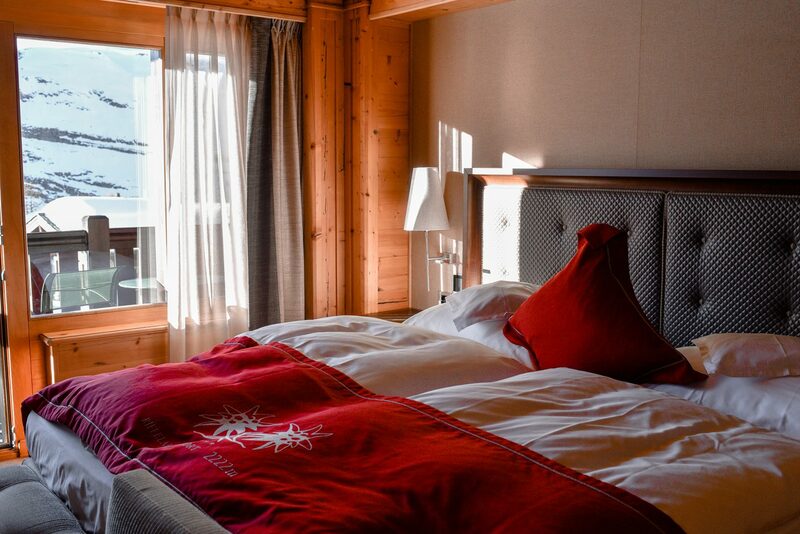 We were so lucky with our room, it felt like a dream waking up to the Matterhorn view. There was nothing extra in our room, only the things you will need the most. The bathroom features an enormous bath and a tropical shower. Queen’s sized bed was super comfortable and it was probably the best sleep of my life. 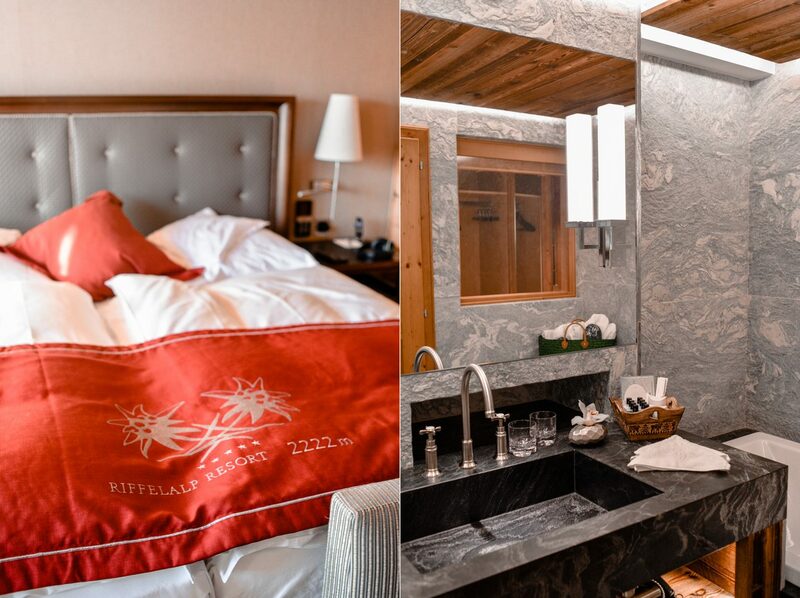 The hotel is good for both, people who can ski and for people who just really want to experience the real Winter Wonderland and maybe ski for half a day. 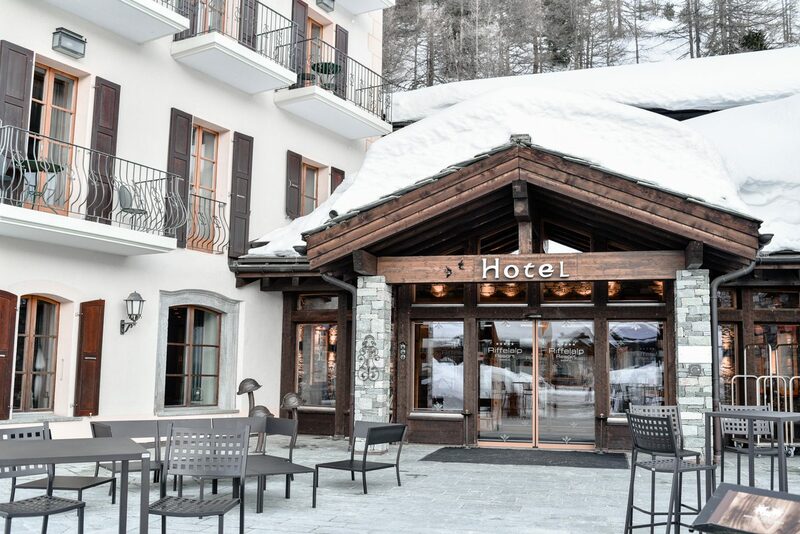 The hotel perfectly located in two stops from the highest peaks, and you can rent the skiing equipment right in the hotel’s ski shop. They can also help you with most of the ski-related things, likes ski passes and instructors, etc. We only skied for a day (as we are the complete newbies) and spent the rest of the day enjoying the most beautiful outdoor pool I’ve ever seen in my life. If you decide to visit the hotel during Summer, you will need to know that you won’t be able to ski, but some people still love to hike around the area and also ride the bikes. 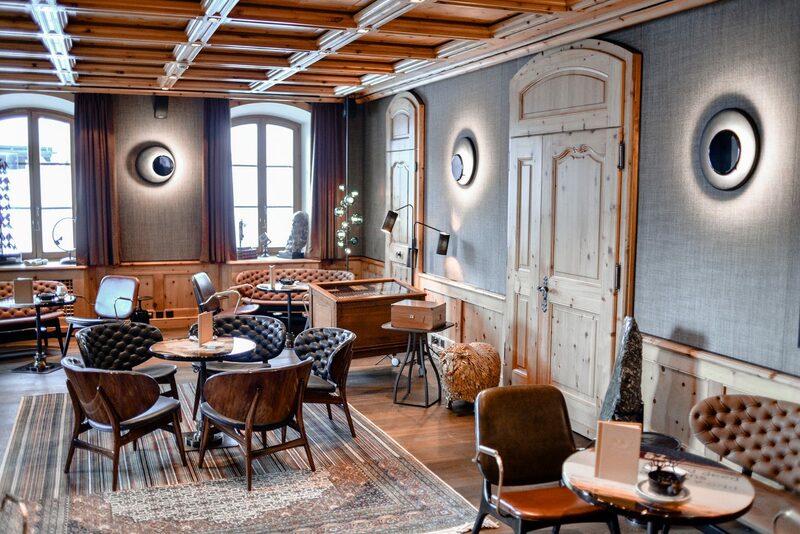 I’m sure the hotel is not less beautiful during warmer months, but it’s definitely more special during winter. 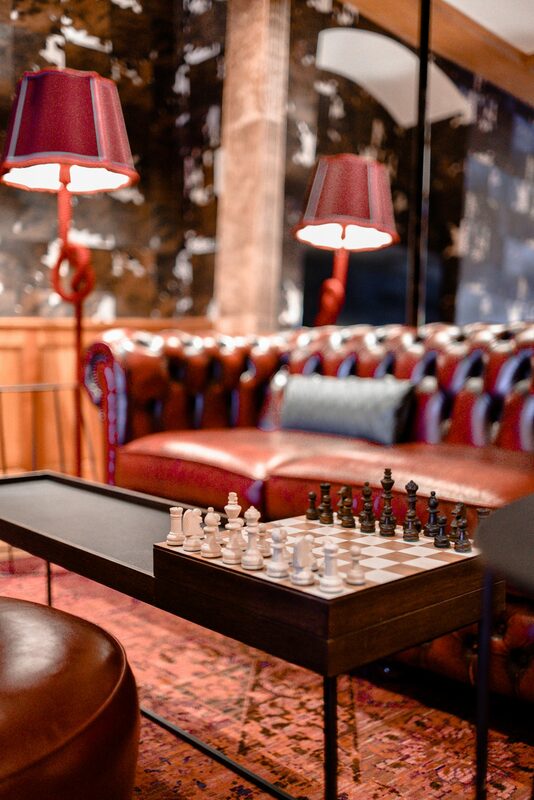 The evenings most of the guests spend in the bar, playing all the types of the board games with beautiful live piano music in the background. Our last evening we spent playing bowling, so it’s safe to say that hotel has plenty of activities to offer and it’s simply the best place to spend your family vacation or a honeymoon. Every evening I would witness how the manager of the hotel would come to the guests and will have a little chat about how they spent the day, what are the planning to do tomorrow and generally, chatting about life. Since the hotel is not too big, it’s possible to know all of the guests, especially considering that majority of them come back every year. 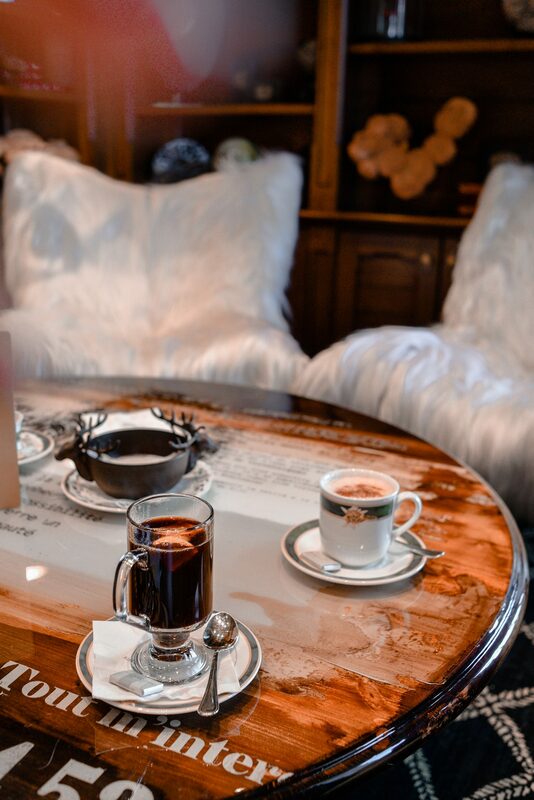 There is some member-club atmosphere in Riffelalp, everyone is super friendly, but you can still feel you are at the exceptional place. This place will definitely be missed and I’m really hoping to come back one day (this time, of course, rocking the slopes ⛷).